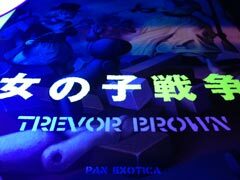 Trevor Brown's "Girls War" book was printed in May 2013 and is available in three different editions. The regular and special edition are both hardcover books with paper dust jackets. The dust jacket has a matte finish. Both books are signed in black marker by Trevor Brown. The special edition is limited to 300 pieces (not individually numbered) and says "Special exhibition version with miniature book" in the back. The front cover of the special edition also glows under black light. The mini edition is about 1/4 the size of the other books and was only supposed to be available as a package with the special edition. "Special exhibition version with miniature book" is printed in the back of the book. The book is softcover, no dust jacket and is a gloss finish. All three books contain all 34 artworks. Each book is 80 pages long. Complete list of artwork in Girls War.